An Uptown Update reader who was at the Town Hall meeting was kind enough to take notes and summarize the discussion on how we all can work together to create a safer community. Let the gangbangers know that we are not tolerating the crime in this neighborhood anymore. Take this around and ask local businesses to post this on their walls or windows, and hand this out to neighbors in your building. Last night Sen. Heather Steans and I hosted a Town Hall meeting on public safety in Uptown. Having attended numerous CAPS and block club meetings in recent weeks and after hearing from the Uptown business community as well as individual concerned citizens, Sen. Steans and I decided we had to come together as an entire community to address the recent spikes in crime in Uptown. The meeting was attended by well over 400 people from every walk of life in Uptown. It was an impressive crowd representing the diversity of Uptown: young and old, lifelong residents and new arrivals, gay and straight, rich and low income folks, owners and renters, businesspeople and social service providers..in short, the entire rainbow that makes Uptown a desirable neighborhood to live and work in. Everyone was concerned about the recent shooting incidents and the apparent uptick in gang activity. Everyone was also concerned about pulling together as a community to increase enforcement, assist the police, provide better alternatives for youth, enhance the business environment and make all residents feel safer on the streets and in our parks. Sen. Steans and I chaired the meeting. Participating in the panel were 23rd District Commander Kathy Boehmer, 23rd District Tactical Lieutenant Robert Stasch, Deputy Chief of Patrol Bruce Rottner, Deputy Police Superintendent Bea Cuello and Ald. Schulter's Chief of Staff Dan Luna. 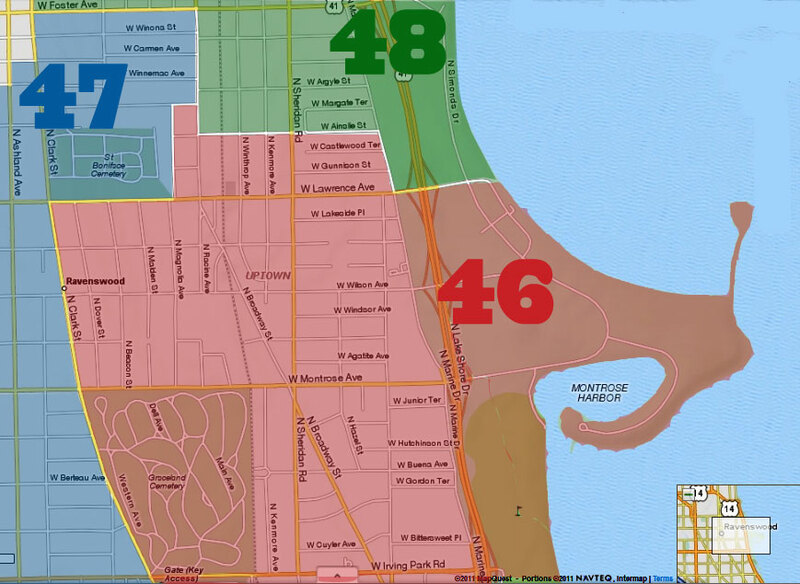 Attending the meeting were 46th Ward Ald. Helen Shiller, Ald. Smith's Chief of Staff Doug Fraser and 46th Ward Streets and San Superintendent Don Nowotny.  Focus on eliminating negative activities like public drinking/drugging, gang loitering, etc. As a next step, Sen. Steans and I will be convening a meeting of leaders of key stakeholders in the Uptown community including elected officials, community and business organizations, social service providers, youth service agencies, the Chicago Police Department and others. We will go through the pages of notes and recommendations made at the Town Hall meeting and begin to develop strategies and plans for moving forward. Following the Uptown leadership meetings, we will convene another Town Hall meeting to present ideas and strategies for discussion by the community, and seek support and participation from the entire neighborhood. Many, many thanks to the hundreds of people who attended and participated in last night's meeting. Heather and I look forward to working with the community to continue to make Uptown one of the City's most desirable and safest neighborhoods. After years of being silenced, the voice of the people of Uptown has now been heard. We need, want and deserve safe streets, better opportunities for our youth, thriving local businesses and politicians who will hear us and help us. I look forward to the next steps. That Harris email deserves its own posting on Uptown Update. ..I must tell you, between the Community Meeting earlier this week and the Wilson Yard group looking to file suit, I have been completely re-energized! Thank you to all of those that continue to fight and do not give up. You have given so many of us the strength to catch a second wind and come back with twice as much energy! All of us in the community owe a debt of gratitude. That perhaps, someday in the near future, we may actually have a community that is getting better and safer for EVERYONE! I'm going to take issue here with the last line in the document, the one that says change in Uptown is going to require sacrifice. This is patently untrue. The dictionary defines sacrifice as "a loss incurred in selling something below its value. " This implies that you'll have to give up something that you value more than the safety and security of Uptown. Is this really the case? We're asking for a couple hours of your time for Caps meetings once a month. Do you really value TV that much? Or Reading? Or spending one night with your children? To me, giving up one night with my daughter a month is well worth increased safety and security in Uptown. Therefore, there is no sacrifce involved, what I'm getting I value more than what I'm giving up. Just my two cents. Missuse of the word sacrifice is one of my pet peeves. From all accounts, it appears that a few scattered site rental properties have been infiltrated or are being used as a base of operations by gangs and that a failure to manage the properties and/or enforce the terms of tenancy have contributed to an intensified level of gang-banging, drug dealing and gunfire in the neighborhood. 400 residents meeting with elected officials is a great community-building event. But 400 residents meeting with and demanding accountability from site managers and the CHA? That's better than good and likely to be a lot more effective. I actually sent a letter and 2 emails to the CHA regarding the enforcement of their own rules, and terms of their lease agreements. I sent these approximately 10 days ago, and did not hear back from them - not that I actually expected that I would. Their silence was a clear sign to me that they are not interested in adhering to their rules, or addressing the issues and problems in some of their buildings. Hi Eagle. you have a good point about the 'sacrifice' thing. however, we should take the word in context (despite it's clear definition). I am NOT questioning your resolve, but consider this: one night per month may not cut it. as a community we must be vigilant. we must act at every opportunity we have, and opportunities don't arrive on schedule. I'm defining an opportunity as simple as posting this flier in your building hall. Wouldn't you rather be with your beloved daughter that doing any of the items listed? Your dedication to your community (while a righteous cause for Uptown AND your family) is at the expense of your time. time rather spent with loved ones. You sir, are making a sacrifice, you may not feel that way but that just speaks for your character. See, thats a false choice. Would I rather Uptown already be a lovely safe place that I didn't have to put time into? Sure, of course I would. I'd rather be at the park with my daughter. I'd also rather someone double my paycheck. And I'd rather have Filet tonight than chicken. I'd rather that my arteries didn't clog when I ate McDonalds(god how I love quarter pounders). But thats not the state of the world, so the choice to give up McDonalds isn't a sacrifice. I value my health and longevity more than those sweet succulant burgers. 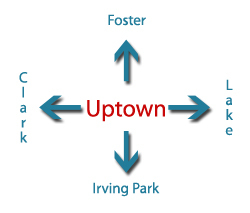 Here's the choice in Uptown as I see it. Would you rather spend six nights with your daugther in a safe neighborhood and one night patrolling the streets, or seven nights with her where its not safe to be outside. To me, thats the choice I face, and a clear one at that. I'm with eagle here. I say we each choose a posting and completely pick apart every single word of every single post and comment until we are all lost in semantics and Uptown falls by the wayside. That'll show 'em who's in charge here. True Action Be Damned! I understand your logic; well said. Perhaps I should be a bit more judicious of what I consider a choice. no need to be sarcastic, chuck. I just want to know my valuable time is being well spent on good decisions. Clearly, this is the important assumption here, and to me, thats what we were asking for at the meeting on Wednesday. The people in that meeting were saying "Hey, my time is important, but I'm willing to exchange my effort for a safe neighborhood, please help us figure out how to make sure our efforts aren't wasted". Right now, it feels like going to Caps meetings, putting together positive loitering and community watch walks will be a net positive. Chuck, I don't see how I'm picking apart the semantics of the post. We all seem to agree that we want to do something, I'm simply arguing that what we're going to get out is more than what we're going to put in. What exactly is true action? Is that something where some people kill themselves to clean up the neighborhood while other people get to reap all the benefits? I guess I just don't get it. j2c--I'm really glad to hear you've contacted the CHA. We need to keep this pressure on and we need to build on it. We need to contact the manager of the property too. The best case scenario is: (a) a portfolio of police calls / actions, (b) an account of continuing efforts to remedy locally, and (c) official responses / recorded actions of local cpd. Then we work our way up. CHA officials are reluctant to nullify leases (and with good reason), which is why doing our homework and building a verifiable case is so critical. Btw, Greg and Heather can lend a hand here but they can't do our job. What's more, the one elected official that should be in our sights on this, besides the Alderman and her staff, is the Mayor. Interesting interactive article in today's Sun-Times allows you to search for any state, county or city official's salary...I'm impressed even more with Rep. Harris knowing he he makes $40,000 LESS a year than alderman Shiller and has done more in one month than Shiller has done in the 8 years I have lived here as far as public safety & crime issues go! More 46th ward salary factoid fun...even Denice Davis--alderman Shiller's "assistant" has a higher salary than our state representative!